I received this book from the publisher in exchange for an open and honest review. 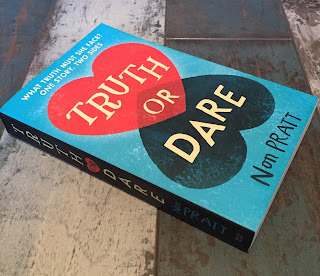 It's been a glorious year for YA contemporary, with The Hate You Give by Angie Thomas, Release by Patrick Ness, Wing Jones by Katherine Webber and now Truth or Dare by Non Pratt. The structure of this book was sheer brilliance and it worked really well for the plot. I loved how the first half of the book was told from Claire's perspective and then the book literally flipped for Sef's. When I got to the end of Claire's section I was initially gutted, as she was a great character and I became really attached to her viewpoint. Seeing the story from Sef's side was really effective, in terms of seeing his views on what had already happened as well as revealing new pieces of the story. Both characters had strong, distinctive voices, and this made me invested in both of their stories. I liked that certain character's motivations weren't always admirable (I'm trying really hard to avoid spoilers here!) as it felt realistic. This also gave me such powerful feels that I cried from happiness a couple of times (which is not at all like me!) It made me hopeful about the state of humanity to think that two people could embark on a journey to raise money for someone else. I thought the book dealt really well with the subject of brain injury, considering how it would impact on the person affected and those around them. Truth or Dare is a heartwarming, moving book that is also very real and funny. Even writing this review is making me want to start reading it all over again. I'm a YA reader, writer and blogger, repped by Sandra Sawicka at Marjacq Scripts. I'm currently editing my Gothic YA mystery set in New Orleans. 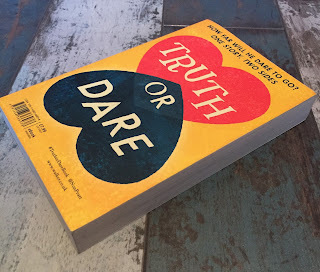 To celebrate today's release of More Than One Way To Be a Girl, the wonderful author Dyan Sheldon has shared her favourite books, movies and TV shows. I've just started reading my copy and it's the perfect mix of fun and humour, set against serious discussions about gender and identity. I'll share a little bit about the book and then hand over to Dyan. One of my all-time favourite YA books (though it’s definitely one that spans generations) is THE SECRET DIARY OF ADRIAN MOLE AGE 133/4. I’m not an expert on fictional diaries, but I can’t believe that anyone’s ever done it better. It’s funny, it’s warm, it’s clever, and it catches the time in which its set perfectly. What’s even better, is that there are more of Adrian’s diaries, following him into the future he never imagined he’d have – and they’re every bit as good. Next up, is Patrick Ness’s THE KNIFE OF NEVER LETTING GO. This is the first book in his brilliant Chaos Walking series, and I have to say it’s my favourite. When I first read it I was, as they say, gob-smacked. It’s so complex, so bold and so original. Indeed, I can’t think of another book it even vaguely reminds me of – unless, of course, it’s the other two in the series. CARNABY by Cate Sampson. This is the story of Sarah, who is not your typical YA heroine. Sarah lives in a falling-down council tower block in London with her mother, her sister and her sister’s baby. Sarah doesn’t have what you’d call a great life; and then suddenly it gets really worse. Her mother is murdered, and it falls to Sarah to find out by whom and why – and to protect her sister and herself. Part mystery, part thriller, and part social commentary, CARNABY is a book that stays in your head. In Charley we have another untypical YA heroine. Born a slave in the American South, Charley finds herself adrift after the horrors of the Civil War and, in a desperate attempt to survive, disguises herself as a man and joins the all-black cavalry of the US Army, the Buffalo Soldiers. This is historical fiction at its best. My very favourite teenager ever is Huck Finn. What’s not to love? Smart, sassy, and, above all, a boy who stands on his own, he is one of the best YA characters ever. But right behind him comes Adrian Mole. An everyboy – or everyperson – if ever there was one. I totally loved the two protagonists in Lisa Williams’ THE ART OF BEING NORMAL, David Piper and Leo Denton. David wants to be a girl, and Leo (who has been there, done that) just wants to be invisible. They are both such lovely people that you wish they lived next door. I don’t think I have one. I would say that I’m not into historical fiction, but the Shardlake books are set in Tudor England, so that can’t be true. And I would say that I don’t read mysteries, but both the Shardlake and Jackson Brody novels are crime novels, so that’s not true either. I don’t watch much telly, but the TV show I can watch over and over and over again (and do) is Inspector Morse, followed closely by Lewis and Endeavour. More recently, I’ve loved Happy Valley (absolutely fantastic with the most wonderful central character), Fargo and Broadchurch. I am a major Wes Anderson fan. He is so unique and distinctive – so intelligent, compasisonate and so incredibly funny. His films are nothing like anyone else’s, to anything we usually expect. Apocalypse Now, an adaptation of Joseph Conrad’s fantastic novel HEART OF DARKNESS that moved the story from the Congo in the late 1800s to the Vietnam War, is one of the greatest films ever. Even though the production was beset by a troop of problems from the weather to its lead actor suffering a near-fatal heart attack. Thanks so much Dyan for your recommendations and thanks everyone for reading. 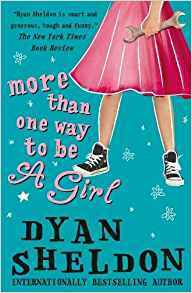 You can find out more about Dyan's books here or buy More Than One Way To Be a Girl here. It's taken me a while to put this review into words, because I feel so strongly about Release. This book wasn't always easy to read, as it deals with difficult subjects and powerful emotions. It is thought-provoking, compelling and so full of feelings that it's impossible not to be drawn in. This was my favourite thing about Release. Patrick Ness has made it clear that the book isn't autobiographical, but it is very personal. What really struck me was how raw and honest it felt, that Adam's emotions were so convincing and accessible to the reader. Although the story takes place over a short time frame, my connection with Adam was immediate and his character developed over the course of the book. Patrick Ness has this amazing authenticity about his writing, which makes his characters feel real and relatable. He captures the intensity I remember about being a teenager, and the sense that your decisions and actions can change everything. The structure of the book was excellent, which I can't go into too much because of spoilers. I loved how it took me time to work out what was happening with the dual narrative. The literary references also added another level. I now have a desperate need to read Mrs. Dalloway by Virginia Woolf and reread Forever by Judy Blume, as these books lent inspiration to Release. I really like the fact that I can read them and then go back to Release with something fresh to look for. This book really matters to me and I know it's one I'll reread. 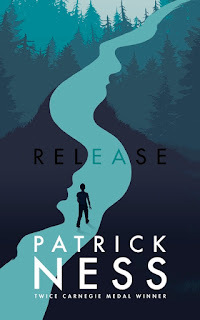 If you liked the sound of this, you have to read The Rest of Us Just Live Here by Patrick Ness.